When I'm not cooking, eating or writing about food, I like to read. There's nothing so delightful to me as a rainy day at home, in my robe, with tea and buns (or scones or crumpets) and a good book (preferably English). There are good books I've only read once, but some books are meant to be enjoyed again and again. Has anyone ever read a Jane Austen novel just once? A day spent in Jane Austen's world can be a marvelous restorative, and I just recently discovered Jane Austen's World, a most scholarly blog where a Janeite can find anything s/he needs to know. And there I have posted a short piece along with my Sally Lunn buns recipe. Basically a brioche, they are good with either sweet or savory accompaniments. My method is so simple--no need for great skill or strength (no kneading) and no need for any special equipment (no food processor or heavy-duty stand mixer). Give them a try and let me know what you think. Come back here on Friday for the strawberry jam! Jean, if you only knew. I bought my new Jen Air unit two years ago and have yet to use my oven. (Shame on me.) Your bun recipe tempts me, though. Well, Vic, I don't know what to say. THAT is a hoot! Two years, eh? Yes, it's time to break in that oven. gorgeous buns!! strawberry jam is a perfect compliment! Thank you so much, Chef Dennis! Funny, I just had one a few minutes ago. A little pre-dinner snack. Took it out of the freezer, wrapped it in a paper towel and nuked it for 45 seconds. All microwaves are different, so that might not be right for some ovens. I hope you'll give them a try! It seems like every time someone comments on them, I've just had one--thanks to the freezer and the microwave (as described above). Actually, I just had two! I like the thought behind what you make. Food is more than fuel, it should be enjoyed, and when possible...remembered. So glad to see your post on these. 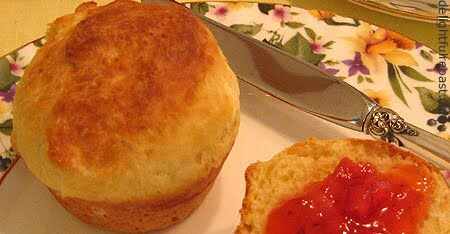 I'm planning on visiting Bath next spring--this makes Sally Lunn's a must stop visit for me now. I'll have to try the recipe out before I go though. Looks too tempting to wait that long! I'm so jealous--would love to be going to Bath next spring! Be sure to tell me all about it and how you liked the buns! Ooooh it's always nice when things from your favorite books comes to life! :) Might have to throw a Jane Austen party just to make these buns! Now to find other Janeites to invite! Thank you, Anyonita! You shouldn't have to look far for more Janeites to invite! Wish *I* could be there!